Nyoni based her screenplay on real stories of women in Zambia who were accused of being witches and subsequently sent to witch camps, which Nyoni researched in the African nation of Ghana. With a gentle tone and matter-of-fact storytelling, the film plays out like a fable. 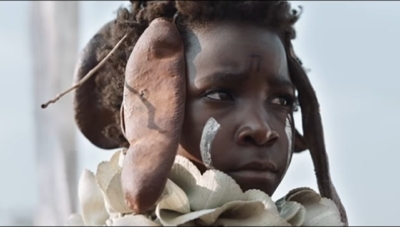 But because the young girl accepts her fate so stoically, it also feels like an understated slice of Zambian life with undertones that suggest Nyoni may be poking fun of western cultures who have no idea witch camps exist. The plot is simple: a young girl no one knows suddenly appears in a village. Is she an orphan? Will someone take her in? Such questions aren’t asked. Instead, after the girl witnesses a minor incident and is accused of being a witch, a chain of unfortunate events is set in motion. Local authorities question her. A witch doctor is consulted. When she’s pronounced a witch, she’s taken to a witch camp where only old crones are held—“restrained” by ribbons that wind back onto spools so they can work the fields. The ribbons are to keep them from flying away, and tourists come to see them and take photos. Given the choice between wearing a ribbon tether and accepting her place in the witch camp or else turning into a goat, young Shula (who is named by the old witches) chooses the former. 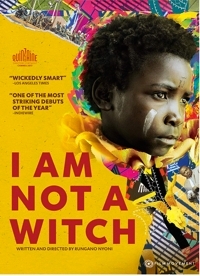 The film follows her confinement and exploitation as a witch, with Maggie Mulubwa turning in a credible performance as Shula, who speaks more with her eyes than she does verbally. Though the narrative is uncomplicated and the story moves at a deliberate pace, viewers still find themselves worrying about what will become of Shula—especially after her “witch” powers reveal themselves and she becomes exploited. I Am Not a Witch has a quiet power. While it’s not exactly The Handmaid’s Tale, I Am Not a Witch provides another instance of women being persecuted, mistreated, exploited, and restricted as to what they can and cannot do. But while Margaret Atwood’s tale was speculative fiction, this tale is based on a reality that most people will find just as hard to believe. Yet, because of adult situations and subtitles that need to be read, it’s really for third graders and up. 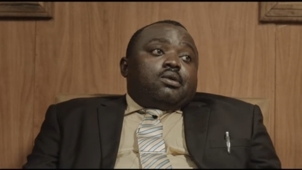 Also included, though, is the director’s third film, Mwansa the Great (2011), a 23-minute short about a young boy who accidentally breaks his big sister’s “magic” mud doll their late father gave her and decides to make amends. Never mind that he had been fantasy-playing, pretending to be a warrior killing a big lion. He knows he did something bad. To atone, he goes on a journey to fix the damage and prove he’s great after all, with village children accompanying him as witnesses. This short film is perfect for entire families, as there’s nothing the youngest ones can’t see. In fact, I can imagine preschoolers being just as fascinated with this short film as older children. You don’t need to be able to read the subtitles, because the action is pretty clear, and there’s a fun backdrop of voices singing to go with the joy of childhood that the film conveys. 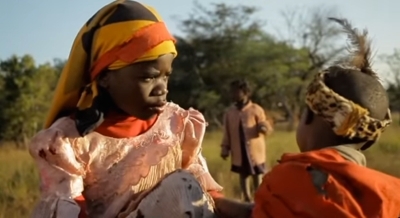 There’s plenty of footage of Zambian children playing make-believe, from girls pretending to have a mother-daughter tea to all of them pretending to drive in a car together (though it’s really just a small push toy). Mwansa the Great celebrates the childhood world of imagination, and that world isn’t just restricted to Zambia, of course. Nyoni cleverly shows what the children imagine themselves to be—adults engaging in activities—then shifts back to show us children with their toys, reinforcing that we’re getting a glimpse into their imaginations. And the film has a nice upbeat pay-off at the end, though it might be confusing enough that families will want to talk about it. Would I recommend buying this DVD just for the short film to show as a warm-up to the main event on family movie night? You bet!